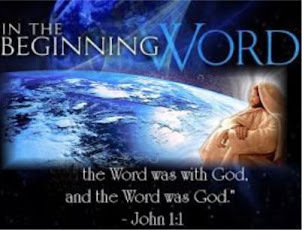 As per John 1:1 In the beginning was the Word, and the Word was with God, and the Word was God.The Word is God, not the Bible! Jesus Christ is the Word of God. The same was in the beginning with God. All things were made by him; and there was nothing made without him. John 1:2-3) You cannot be born again by scripture, reading or hearing it read; but you can be born again by the Spirit, as you respond to hearing and obeying the Spirit, or the word of God within your heart. (John 8:37) I know that you are Abraham's descendants; but you seek to kill me, because my word [teachings heard] has no place in you. Well all these prove that Word existed before the creation of the universe. Time came into being after God created the universe including Solar System. Then days and months came gradually in the minds of the people. With the new inventions like telescope so man came to know so many things.Some months were named by Julies and Augustus Caesars.Time is a relative factor. If no space then there is no abstract factor called time Therefore Words of God existed even before the creation. So we can say Word of God is eternal as God is who is Alpha and Omega. In the book of Genesis the first Chapter verse 1 says in the beginning God created the heavens and Earth. Well you might ask how did that happen out of nothing. No, the word was there. To present to you in a simple way: We all know that energy cane be converted to different types. Heat to light, Sound to Heat, Electric energy to light energy and so on. Energy is convertible factor. Therefore the word uttered by God is convertible I suppose. Therefore creation and all forms of energy in it. We are unable to explain the form of God, but can say He is awesome. There is nothing impossible with God.Therefore the powerful word of God existed before the act of creation.Just observe and think of what sound can do, what words can do. Each time you listen, hear, and obey, the Lord writes his words in the flesh of your heart; which is the en grafted word, which is able to save your soul. James 1:21. The more you hear, the more the word abides in you; the more it abides in you, the more it controls you - the more you are doing his will, not yours. The more you hear and see revealed in your heart by the Word in your heart, the more you understand the things of God. As per worldometers. info out 7.5 billion of the total population in the world 2.173 billion are Christians. The faith of all these people is based on the Holy Bible or the Word of God. All the Christians believe in One Almighty God, in Holy Trinity, death and everlasting life. They all believe in the teachings of Jesus Christ, The Word (John 1:1). Why one third of the world populations believe in the Holy Bible or the Word of God? All these Christians believe that the Word of God is infallible and inspired by God. Day by day this number is getting increased just like number of births per day is getting increased by thousands. God is inspiring the people to read and believe in The Word of God. Day by day inspiration of God over the authors who wrote the Bible or the Word of God is been proved with new findings. As the world is developing the sciences, the subjects like Archaeology and Bibliography are better understood. Archaeologists are inspired to find more sites which have biblical background. More and more findings will expose the Bible to a better understanding. The facts mentioned in the Bible, ultimately will prove the Words, 40 authors have written in 73 books under one theme. Omnipotence God has inspired these authors to interpret the Word of God in different languages. How did all the authors of the Bible understood the inspired word of God. In what language did He speak to them? God can be experienced in total silence. God has inspired or breathed,or shown,or illuminated the minds of men such as Moses, Noah, David, and numerous other prophets, through the signs of the times or through many other methods which only the person concern understood. At the time of meditation or in total silence God inspired countless saints, mystics or many believers. Sometimes they may have seen through their minds eye. Some see vividly what God wants to say. At the time of Jesus 12 apostle just followed Jesus the Word Incarnate even without experiencing a single miracle. Thus Jesus the Word of God inspired them to follow Him. Thus inspiration of God is experienced in many ways. Through vision, through signs, through uttered word, through divine look, through natural phenomenon God may have inspired human authors to write His divine word. The methods followed may have been one or more of above or may be through more unknown methods not mention here. Thus inspiration of God has worked and works in so many ways. The word of God in the Trinity and the incarnate Word of God, Jesus though the Holy Spirit is the source of the Inspired Word of God which imparts to human authors and to many others His Holy Sublime Word.